Animal behaviourists or ethologists are concerned with understanding the causes, functions, development and evolution of animal behaviour. They investigate animals in relationship to their physical environment, as well as to other organisms. This includes how animals find and defend resources, avoid predators, choose mates and reproduce, and care for their young. Animal behaviourists also study the development of behaviour to see the ways in which behaviour changes during the lifetime of an animal, and how those changes are affected both by genes and by experience. Animals studied include single-celled organisms, invertebrates, fish, amphibians, reptiles, birds and mammals. Depending on the employer and area of specialisation, there are many possible work environments, such as laboratories, universities, zoos, farms and natural wildlife habitats. Most scientists involved directly in animal behaviour work in one of four broad fields: ethology, comparative psychology, behavioural ecology or anthropology. These disciplines overlap greatly in their goals, interests and methods. Why did you choose to work with animals? As a young boy I loved my dogs and spent hours training them in my back garden. After visiting Sea World, I knew that one day I would work with marine mammals and birds. From that point on I spent as much time as possible learning about animal behaviour. What training did you undergo? 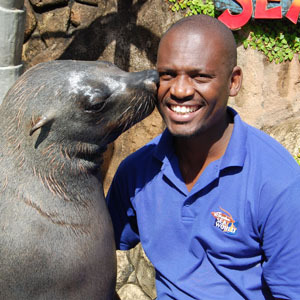 After completing matric, I focused on dog training, and then built on the knowledge I had acquired when I started working at Sea World uShaka. What makes a ‘good’ animal behaviourist? You need to be patient, patient, patient. You also need to be physically fit, passionate about conservation and be a team player. Is experience as important as training? I think you need both and, in my position, one never stops with either formal training or gaining valuable experience. Describe your typical working day Most of my day is spent with the seals. When we arrive in the morning, we check them to ensure they are in optimal health; prepare their morning feeds; spend time playing with them and strengthening the bond of trust; do some training and prepare them to participate in the seal show. What do you like the most about your work? I love sharing my animals with the public and watching the audience as they learn about conservation through the animals. Any dislikes? I don’t like to sit down and do paperwork – but it is essential and needs to be done on a daily basis. What’s been the highlight of your career so far? I loved being part of the move from the old Sea World premises to our new home at uShaka Marine World. This brought so many challenges and was a once-in-a-lifetime opportunity for me to learn about how animals adapt and adjust to change. What are your goals for the future? I am going to continue working towards my goal: a world where everyone cares about the environment. You will notice when I have reached it – we will be living in a litter-free South Africa! Any advice for newcomers? I would advise them to volunteer at their local animal care facility or conservation organisation to find out if this is the work they want to invest themselves in. This is not just a job; it’s a lifestyle. There are some good animal behaviourists that have not undergone formal training, but do spend time in extensive observation and experimentation, such as some animal and dog trainers have done. There are careers in animal behaviour that require only a bachelor’s degree; however, most careers require an advanced degree qualification. A National Senior Certificate that meets the requirements for a diploma or degree course is a prerequisite. A Bachelor of Veterinary Science is necessary to follow this career and a Master’s Degree in Biology or Behavioural Science with Animal Behaviour is an advantage. Another option is to study towards a Doctorate in Veterinary Medicine.